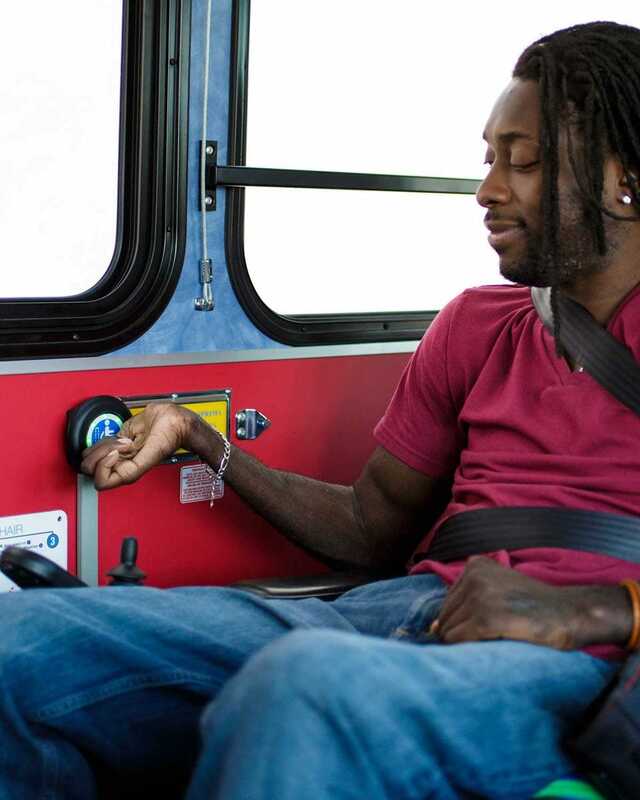 The QUANTUM automatic rear-facing securement station is redefining transit safety by combining securement expertise, intelligent technology and the latest in modern design. 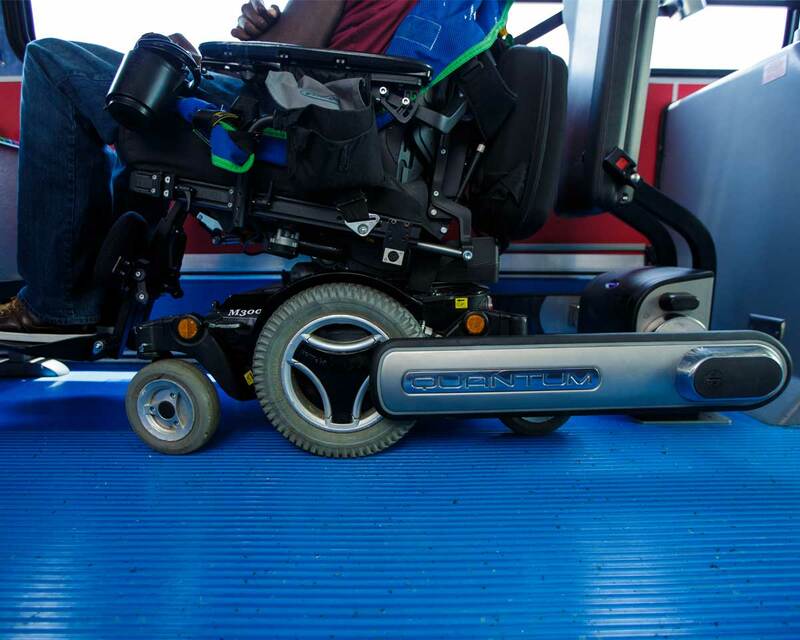 The mobility passenger centers their wheelchair or scooter against the backrest and engages the automatic locking sequence by pressing an ADA-friendly button. 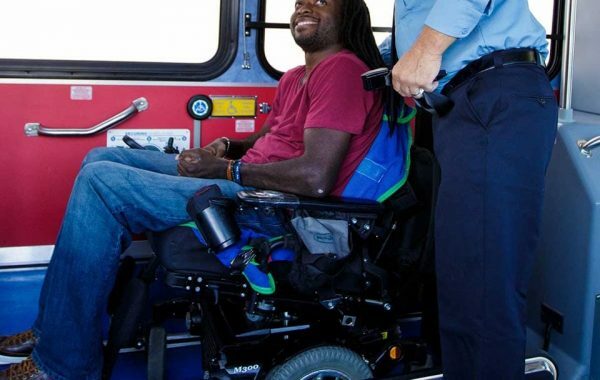 QUANTUM’s arms safely secure the wheelchair in place; and continually adjusting their grip as needed throughout the journey. 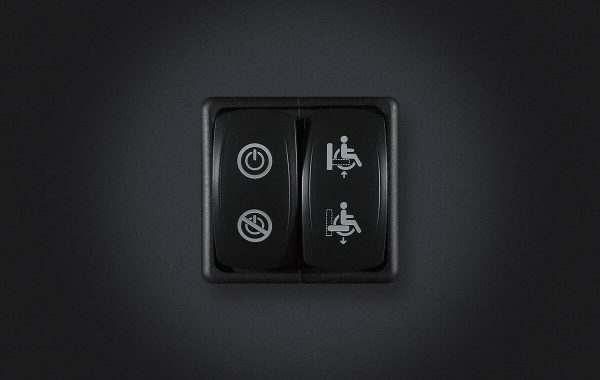 Once the vehicle stops at a destination, the button is pressed again to release the passenger so they can disembark. 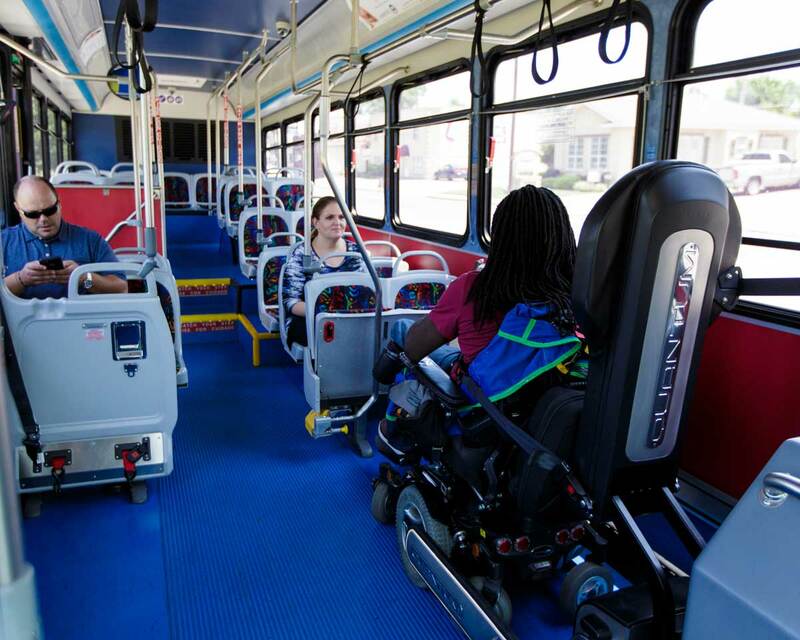 QUANTUM is the only system in the world that gives complete independence to mobility passengers; enabling them to secure themselves in less than 25 seconds with the simple push of a button – and without requiring driver assistance. 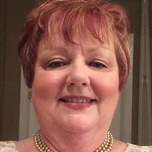 As the preferred securement method worldwide, rear-facing securement is now being widely adopted in North America. Providing enhanced head and neck protection, it is proven to be one of the safest securement solutions available. 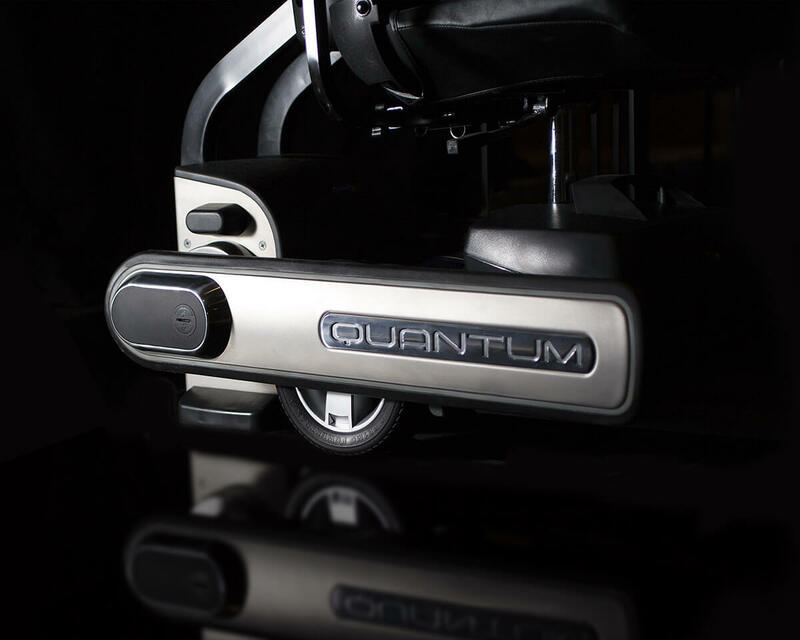 QUANTUM lets drivers stay focused on the road and gives them the flexibility to manage wheelchair securement from dashboard controls at their seat. 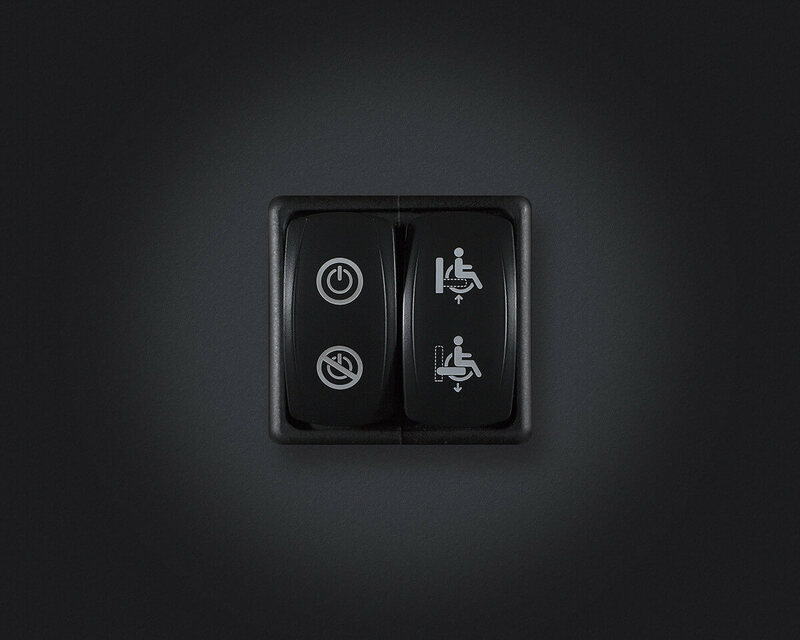 If a passenger is unable to press the advanced CAPTRON™ button, drivers can easily activate QUANTUM to secure a wheelchair or return the station to neutral, allowing passengers to exit the vehicle. 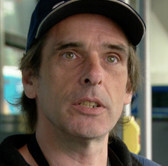 Not even the hustle and bustle of a city bus can stop QUANTUM. 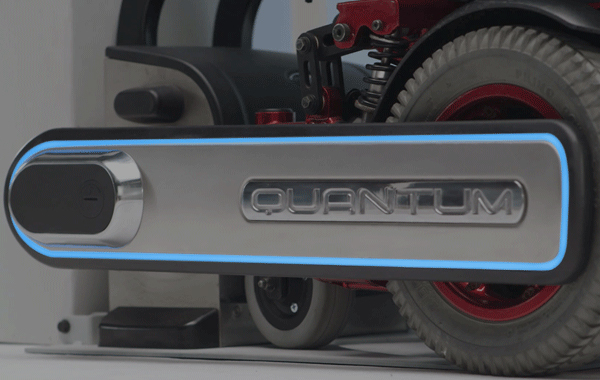 Advanced sensor technology allows QUANTUM to detect any obstacles that interfere with its path, whether it be a standing passenger, a stroller or backpack. After three failed securement attempts, QUANTUM waits for the operator or passenger to reinitiate activation. 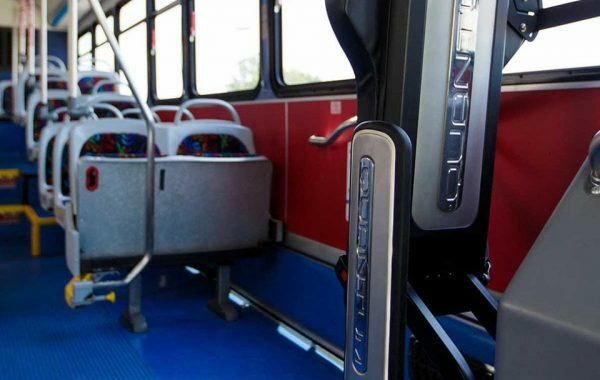 Realizing the necessity for variation, QUANTUM backrests come in sleek, neutral designs that allow for easy adaptation into all transit interiors. 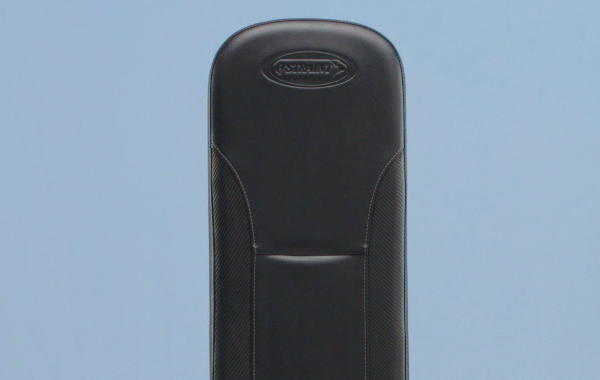 The international backrest features an elongated, narrow backrest, while the US version utilizes a shorter, wider backrest, as per ADA standards. The US version also includes an integrated lap and shoulder belt. These ultra-durable backrests feature heavy-duty vinyl and are built to withstand the wear and tear of consistent everyday use without sacrificing comfort. 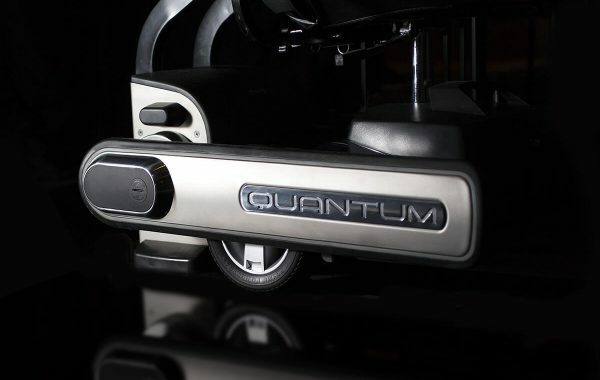 Prior to departure, QUANTUM’S intelligent capture feature grips wheelchairs and scooters at just half the force, giving both driver and passenger the opportunity to make adjustments as needed. 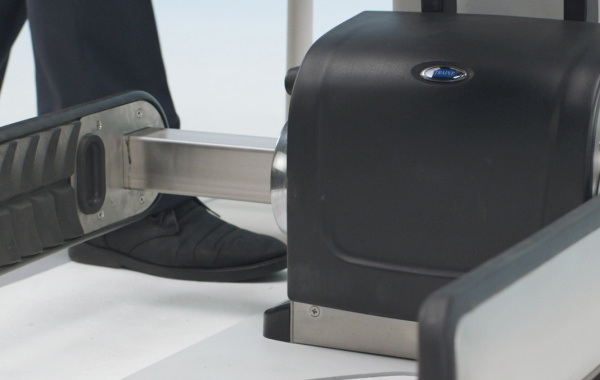 No need to worry about slippery floors, inclement weather or poor driving conditions. 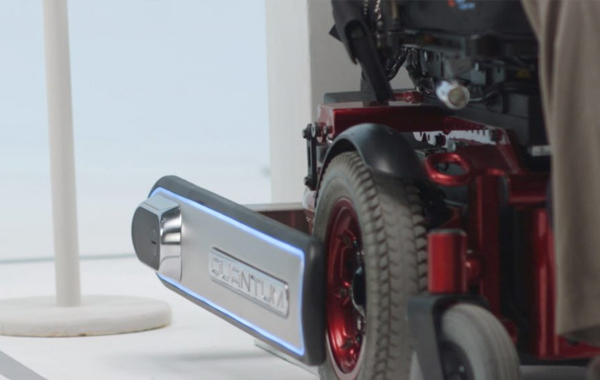 QUANTUM continuously monitors its grip throughout the journey, automatically readjusting to keep wheelchairs and scooters completely secure. 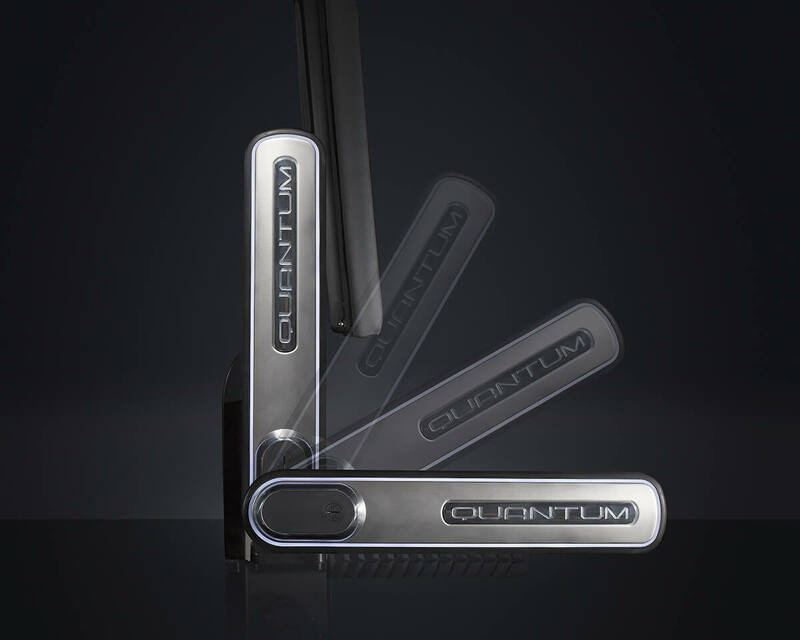 With its stainless steel construction and durable over-mold grips, QUANTUM is built to endure the wear of everyday transit use. The solid framework was built to withstand the harshest seasonal environments, remaining easy to operate over thousands of cycles. 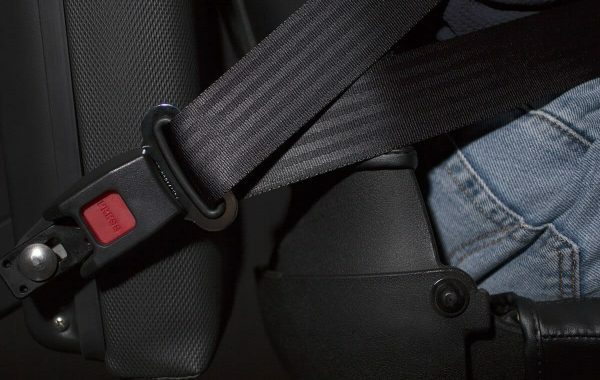 Proper warnings help avoid mishaps by keeping passengers alert. That’s why the QUANTUM design team took extra care in developing the LED lighting system around each moving arm. Clear auditory signals also remind passengers to be conscious of the station when the arms are in motion. 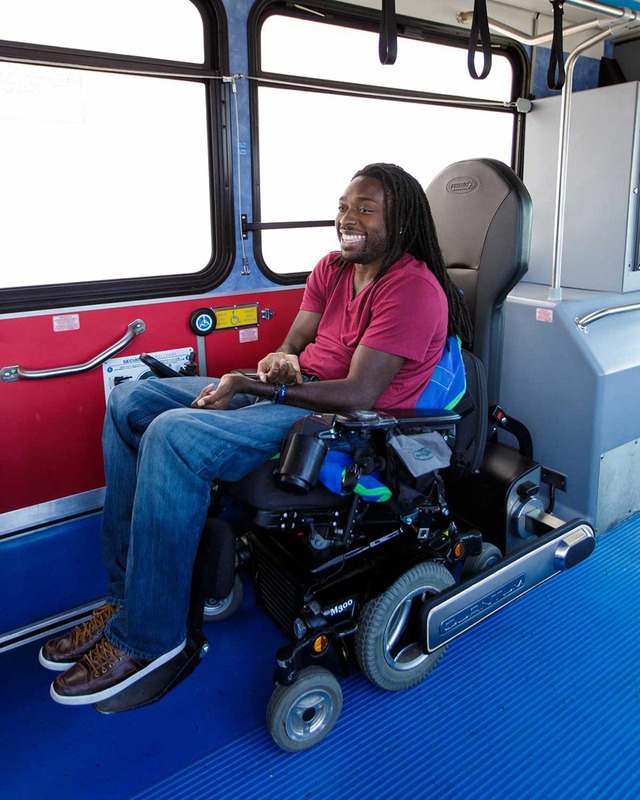 QUANTUM offers mobility passengers the dignity and independence to secure themselves. 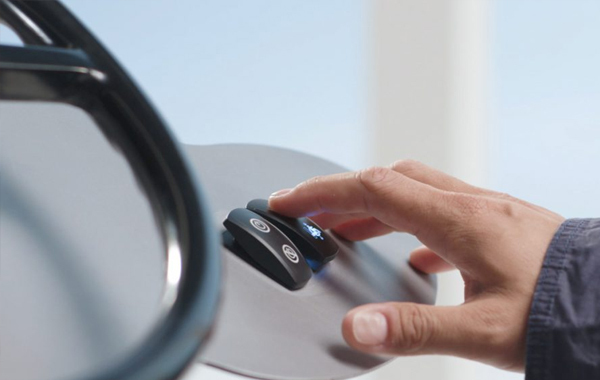 The simple one-touch operation offers users a safe and secure ride while keeping drivers in their seat and focused on the road. 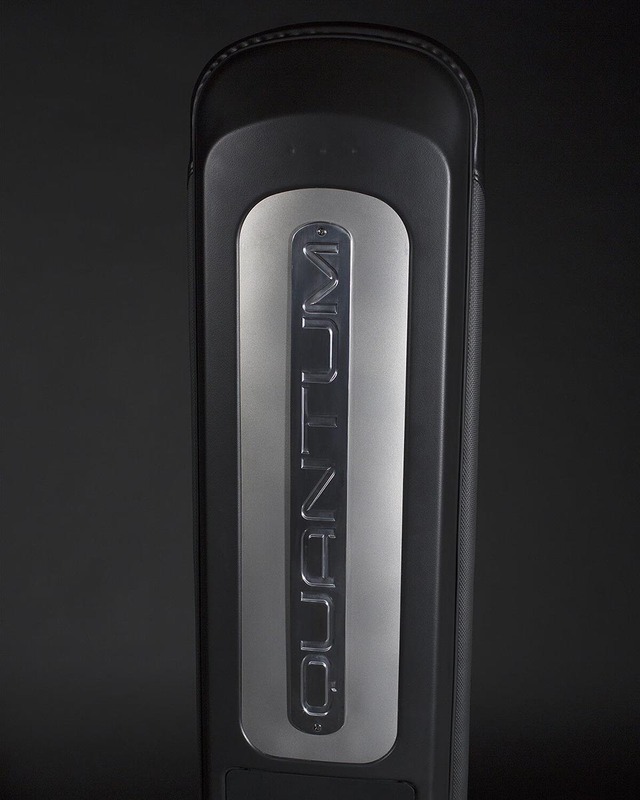 With QUANTUM, safety never depends. 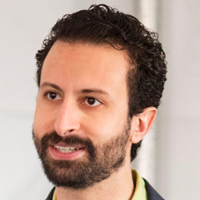 Maximizing safety while minimizing complexity was a key focus when designing QUANTUM. 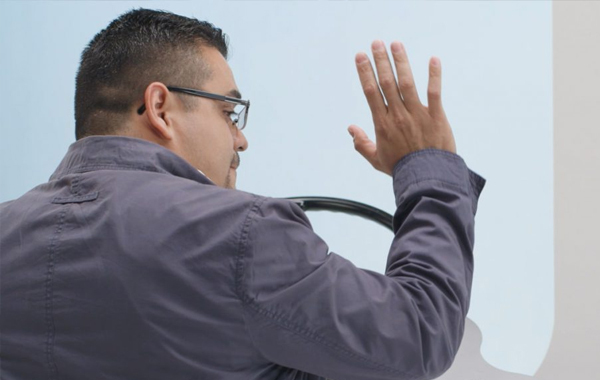 Through extensive field and lab testing we were able to develop a basic maintenance schedule that ensures optimal performance with minimal hassle. 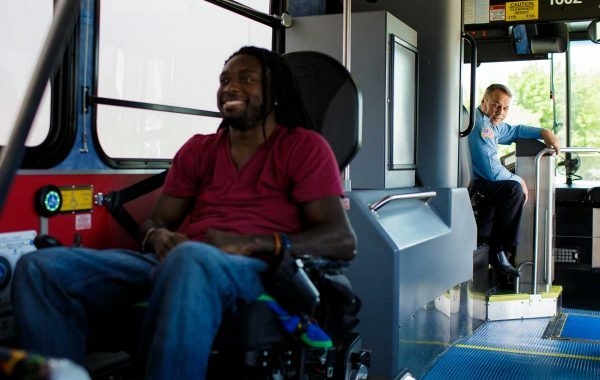 With wheelchair and scooter securement in 25 seconds or less, QUANTUM removes unknown variables and helps keep busses on schedule. With QUANTUM everyone gets going – safely and on time. 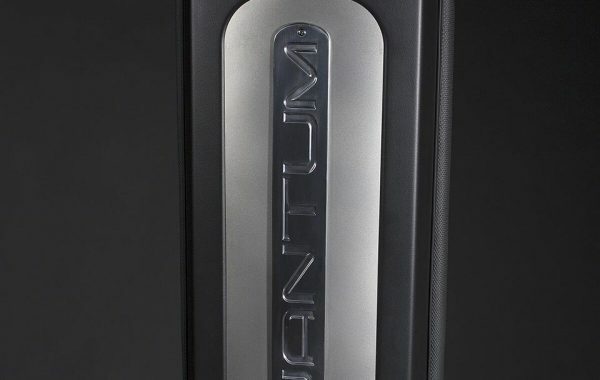 QUANTUM’S sleek design was carefully crafted with compact storage in mind. The securement arms fit seamlessly under modern theater-style seats, maximizing center aisle clearance and allowing for additional seating. 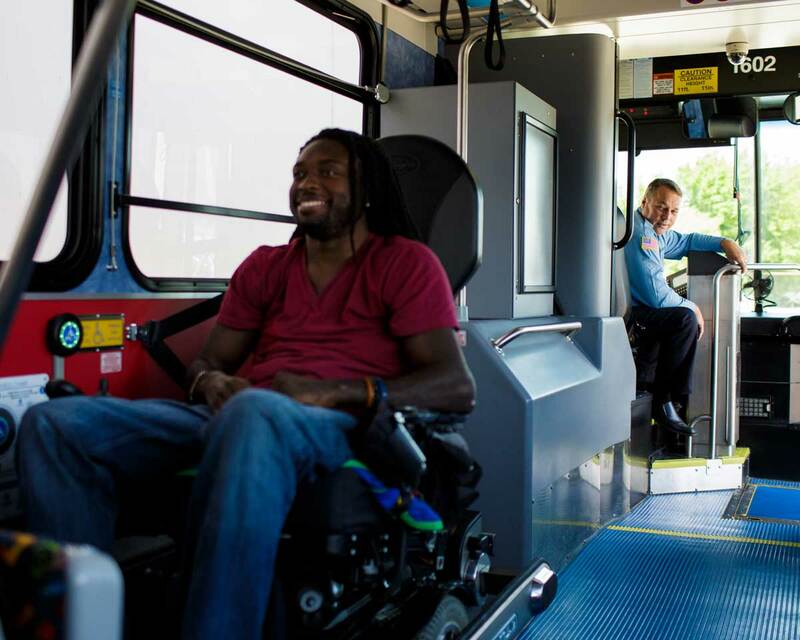 QUANTUM gives everyone the freedom to move, maneuver or remain safely in place. Engineered to blend beauty and functionality, QUANTUM boasts a rugged build that remains equally inviting. Let’s face it, nobody wants to enter a vise, but everybody wants to be restrained securely. 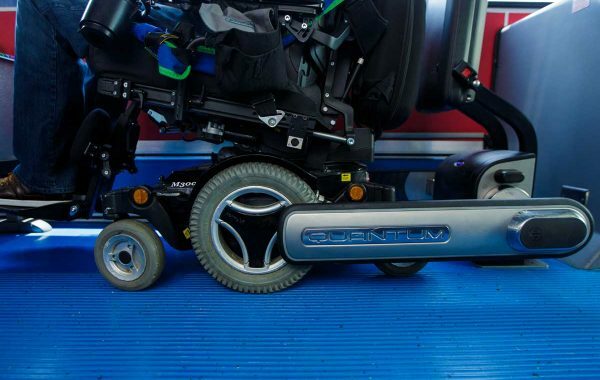 QUANTUM provides the right balance – a solid stainless steel frame and soft, yet durable over-mold rubber that will not damage wheelchairs. 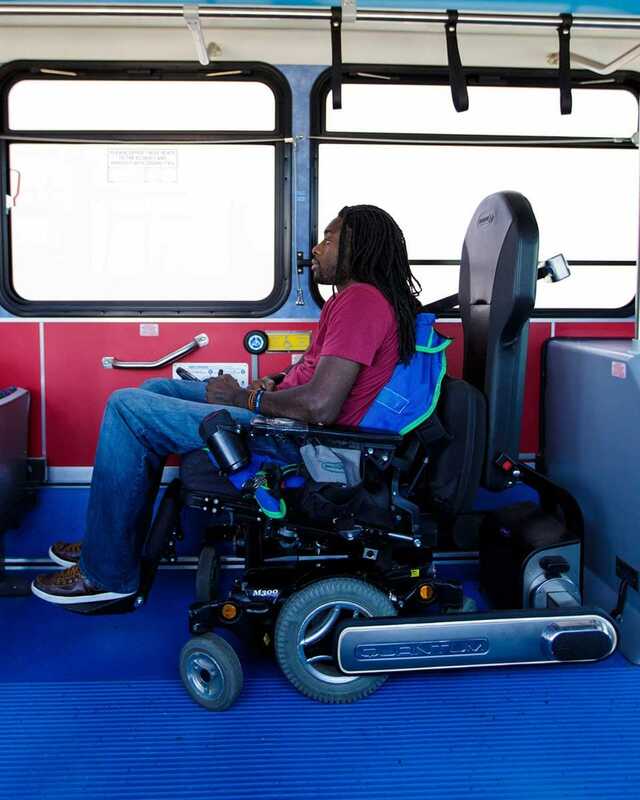 The QUANTUM Securement System meets or exceeds all current regulations for rear-facing transit, European Directives and ADA/CSA requirements. 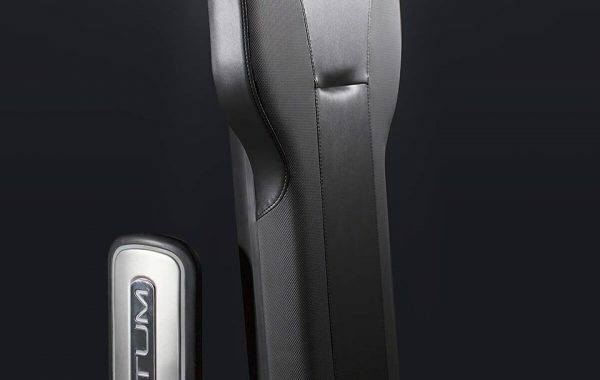 The QUANTUM Backrests conform to the performance specifications of FMVSS 201 or ECE R 21, FMVSS 302 and ISO3794. 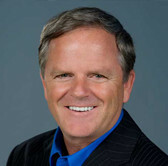 QUANTUM continues to make headlines with news outlets, agencies, organizations, and consumers around the world. 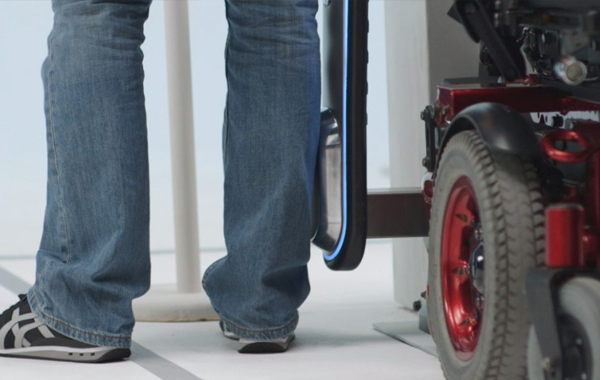 The future of wheelchair securement is here and people are taking notice. 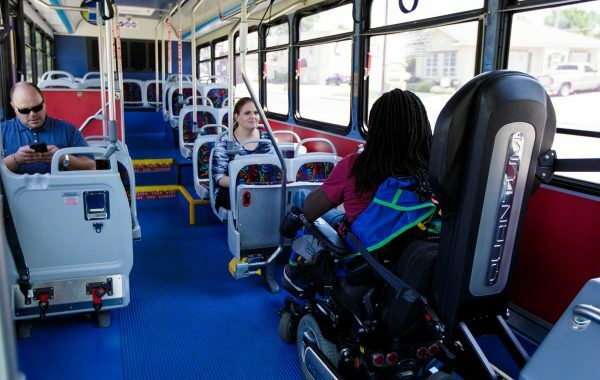 Wheelchair Passengers, Commuters, Drivers and Transit Properties. When you GO QUANTUM, everyone gets back to their journey. 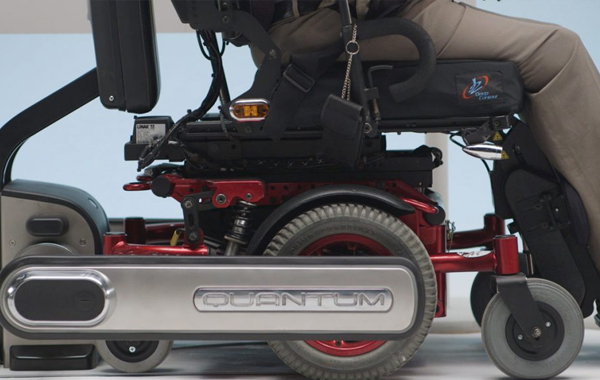 QUANTUM restores a sense of freedom and independence to wheelchair passengers by allowing them to secure themselves. 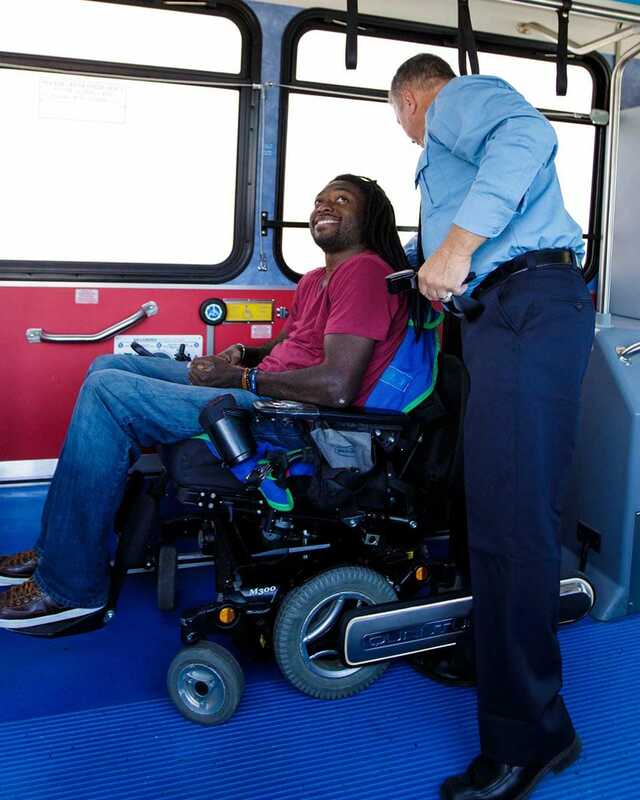 QUANTUM gives commuters the assurance that their schedules won’t be delayed by traditional securement. QUANTUM gets your drivers back on the road. 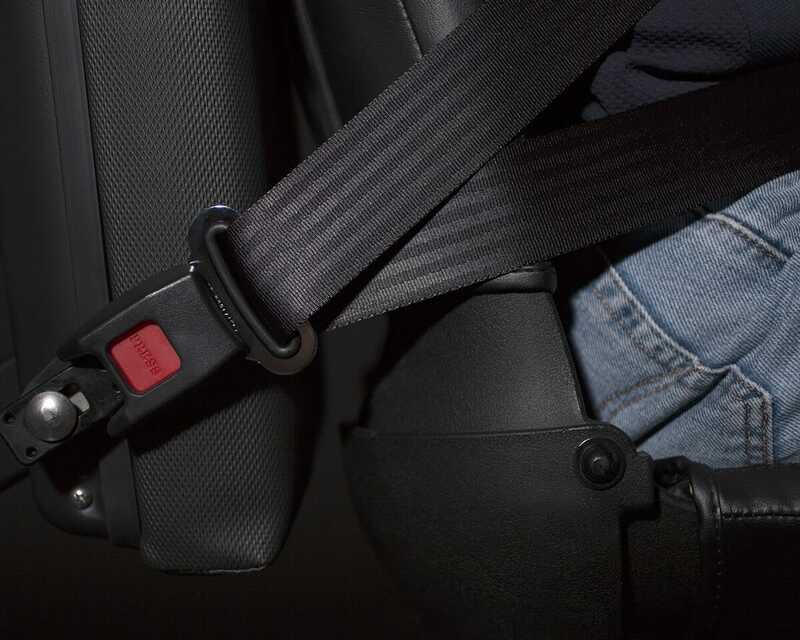 With independent securement in under 25 seconds, your routes get more miles with less curb time. 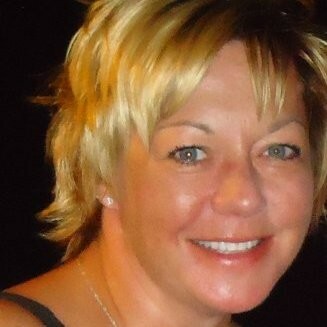 QUANTUM saves your company money with less driver training, less product maintenance, less delays and less liability. 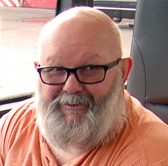 Keep your buses on schedule and your budgets on track. What are the Electrical requirements of the QUANTUM? For the following, we recommend a separate line with clean power, resistors, protectors and filters whenever possible. POWER: QUANTUM requires a fused circuit of minimum 12VDC at 20 amps or 24VDC at 10 amps measured at the QUANTUM. INTERLOCK: A brake or safety interlock signal is required. 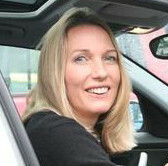 Note that the brake/safety interlock and ignition signals can be supplied in either 12 or 24 VDC with any installation. Additional Electrical Notes: At constant voltages below 11.5v, the QUANTUM will go into a protective state. Additionally, QUANTUM features internal protection against power spikes and Electrostatic Discharge (ESD) to approximately 10,000 volts. All Electro-Mechanical Interference (EMI) is protected coming into the unit, and the QUANTUM does not discharge any EMI. Are drawings or CAD available? Layout drawings and shell CAD are available from our Applications department. 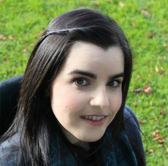 We can provide all necessary information needed to show the space requirements, including minimum ADA requirements along with our own recommendations for layout (ie: beyond minimum ADA requirements). Many of these have already been shared with several OEMs. Can an OEM use their own controls for the driver interface? 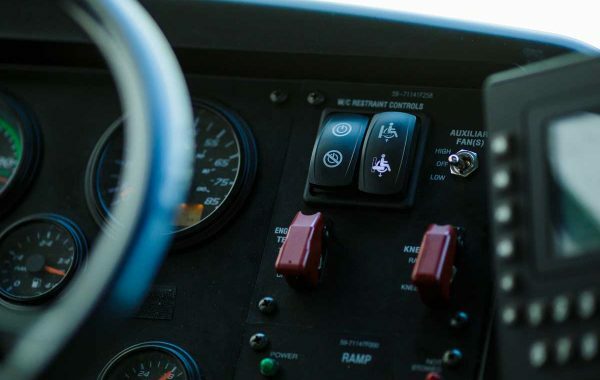 QUANTUM can only be used with our driver control interface, which is two standard automotive ‘rocker’ switches (two, installed on the driver steering panel). 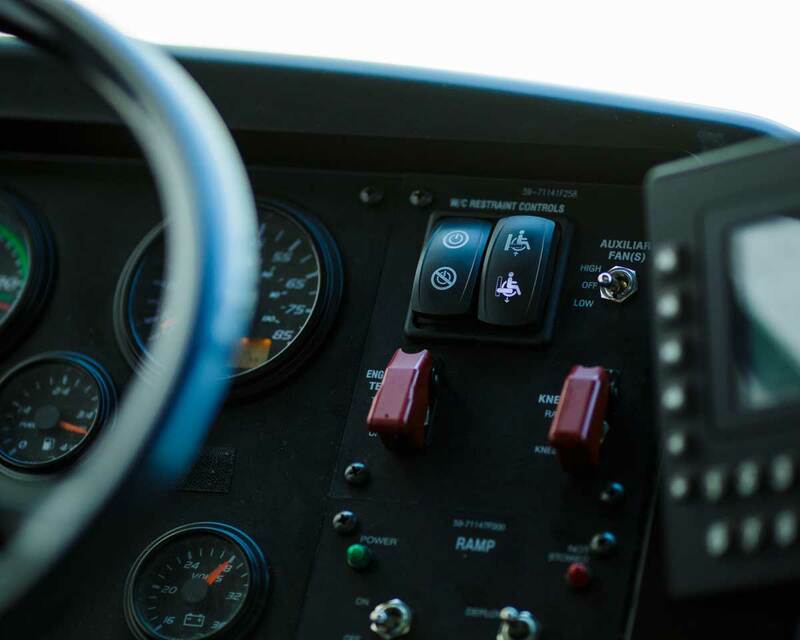 Our custom designed switches show how the QUANTUM operates and also works in tangent with our driver instruction and training material relevant to the drivers’ needs (see specifications on driver interface). Does the QUANTUM work with side facing flip seats? 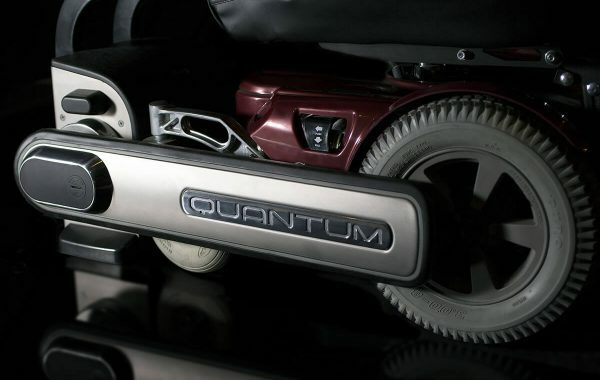 The QUANTUM arms were designed with the thinnest profile achievable, and will work with ‘thin’ flip theater-style seats. 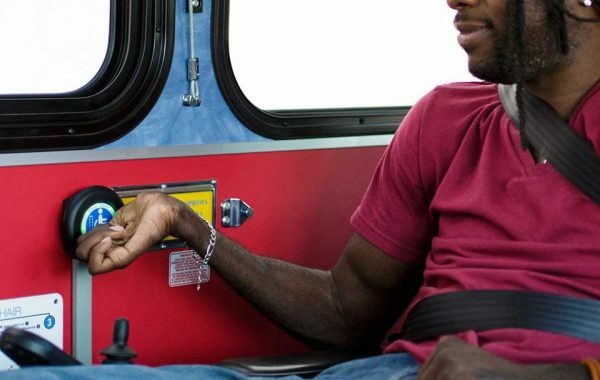 Even the contour on the outside of the arm lends itself to work well with the city bus frame gussets. Will the QUANTUM interface with OEM Input/Output (I/O) systems? 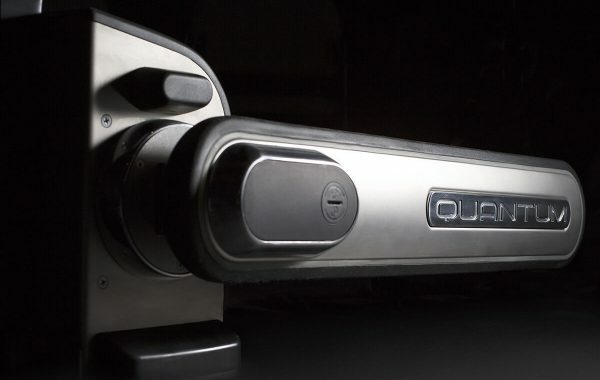 QUANTUM’S sole requirements from the vehicle are a constant 12V power source, and an interlock or vehicle breaking signal to determine that the vehicle has safely stopped. These signals can come from several locations to be determined by the OEM, including their I/O system. With these provided to the QUANTUM, our system drives signal to/from our remote components (ie: driver and user interfaces). What are the specifications on the driver interface? Two 43mm x 24.3mm Rocker Switches with Blue/White LED illumination rated to 20 amps 12V. The ‘ON/OFF’ switch has 5 terminals, and the ‘SEC/REL’ switch has 10. Can the QUANTUM be removed from inside the vehicle? 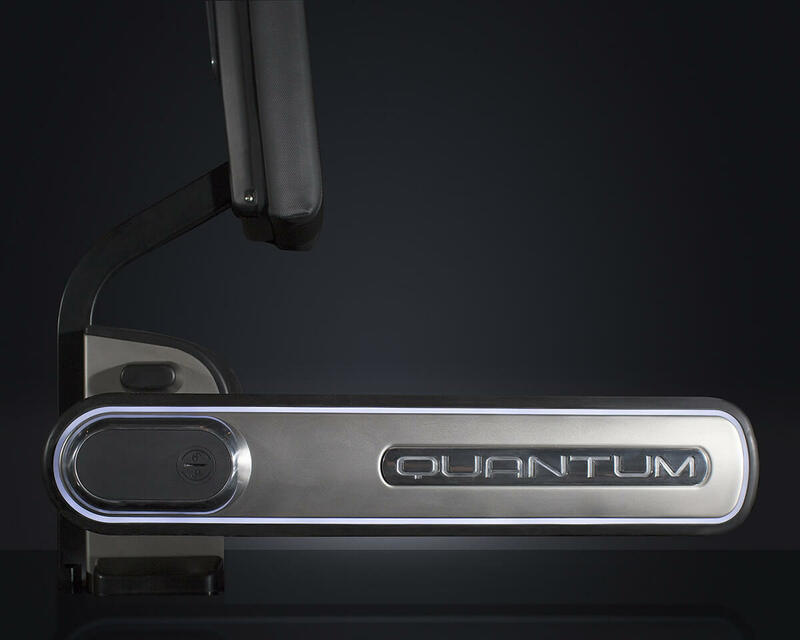 Yes, QUANTUM is installed via a mounting plate that will allow it to be installed and removed from within the vehicle for servicing/maintenance/replacement (if needed). 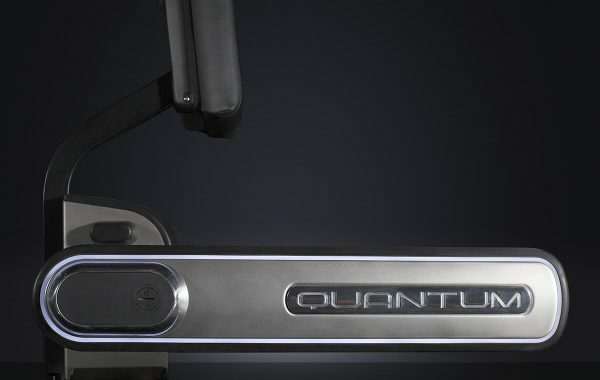 The QUANTUM is attached onto the plate via four threaded studs and a locking nut, and is also attached to the fixed backrest via four screws at the back of the unit. 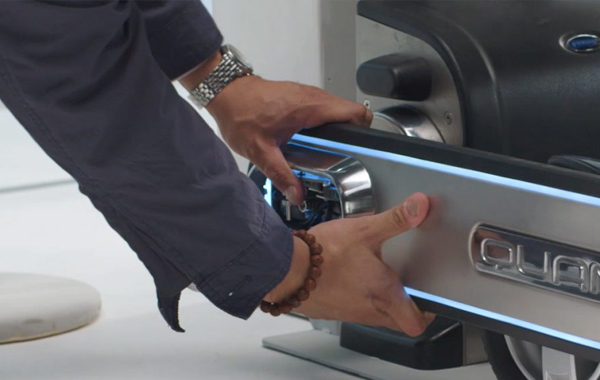 Technicians will be able to remove the side hardware covers and the backrest panel to gain access to the screws. 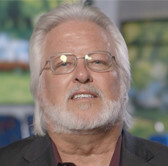 Additionally, they will be able to unplug the QUANTUM via the cable harness connector. How bright is the Quantum LED lighting on the rotating arm? 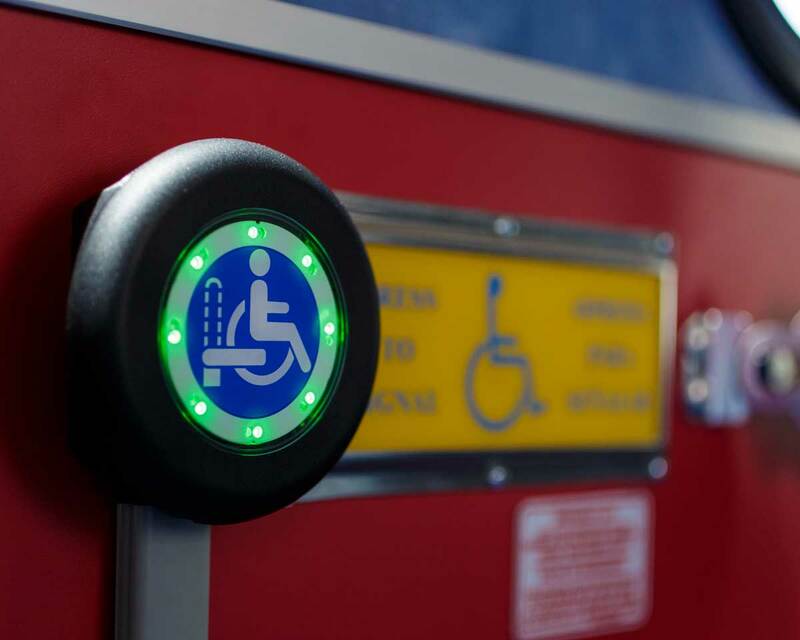 The QUANTUM lighting system was designed as a visual warning indicator for arm movement into the aisle, and to signify securement of the system. 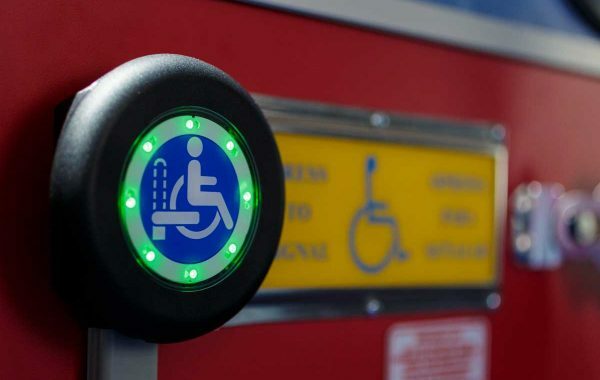 We chose a level of lighting that can be seen in daylight, serve as a visual warning and yet not remain a visual deterrent that brings unwanted attention to the wheelchair passenger area. How does the Driver Interface operate? INTERLOCK NOTE: QUANTUM unit remains interlocked and can not be bypassed by the above controls. This means that drivers may not secure or release the QUANTUM arms when the vehicle is moving. 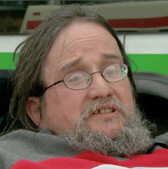 How much pressure is applied to a wheelchair? 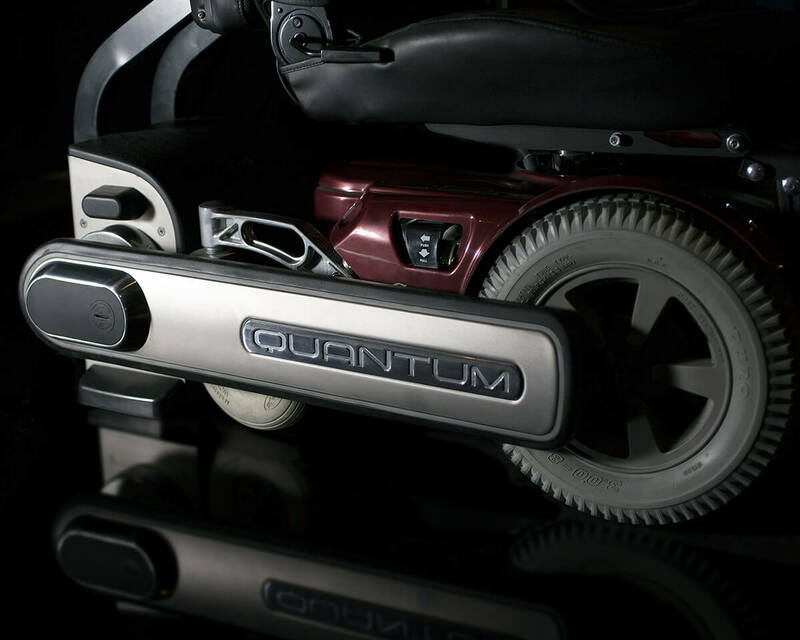 Thanks to a low G environment and the rear-facing backrest, QUANTUM is able to apply a minimal amount of force onto the wheelchairs: totaling approximately 50lbs of force divided onto both sides. 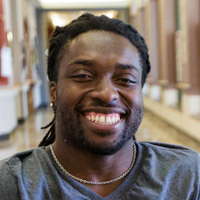 There are two squeeze modes referred to as an initial squeeze and a final squeeze. 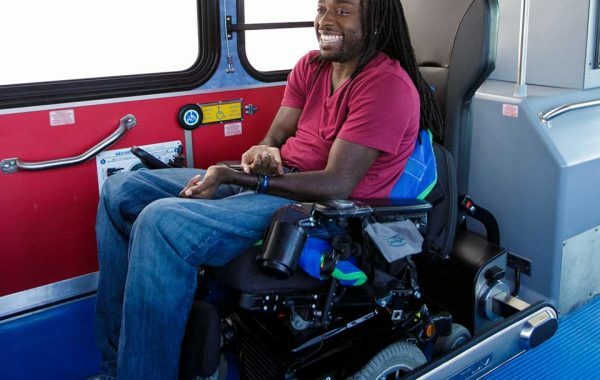 The Initial Squeeze is when the QUANTUM arms first come into contact with the wheeled mobility device. For safety purposes, the initial squeeze captures the chair at approximately 25 lbs. and alerts the driver that QUANTUM is prepared for full securement, allowing him time to ensure there are no concerns before proceeding. 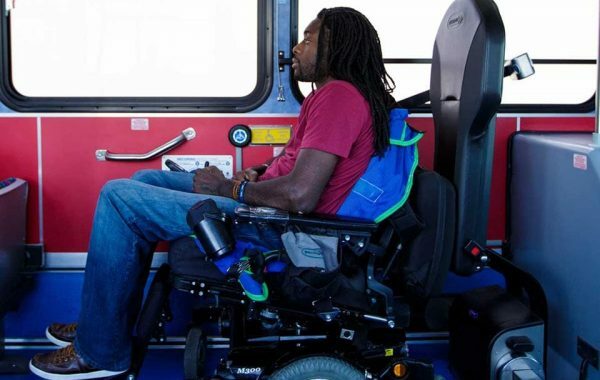 The Final Squeeze occurs when the driver acknowledges via the driver interface on his dashboard, moving the wheelchair pressure to approximately 50 lbs. of force. 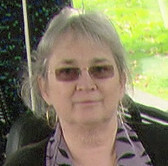 It’s important to note that if the driver does not acknowledge and starts to drive the bus, the Quantum will proceed with the Final Squeeze automatically to ensure the safety of the passenger. Lead time for QUANTUM is 90 days. We are working towards reducing the lead time, especially for instances such as retrofits and other instances where longer lead times may not be possible. What documentation comes with the QUANTUM? 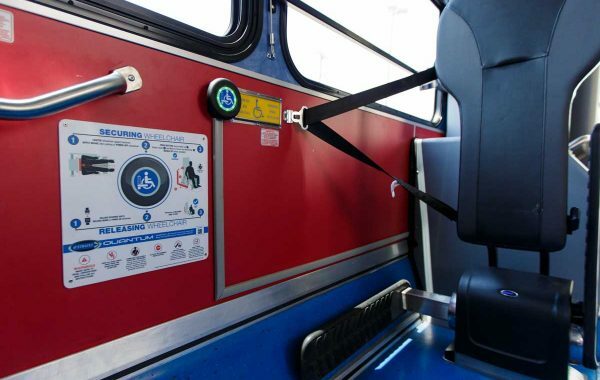 User Guide: gives a background and a how-to-use to wheelchair passengers. This may be strictly digital. Will the Quantum ship with everything needed for an installation? QUANTUM ships with everything needed for an installation in a single box. 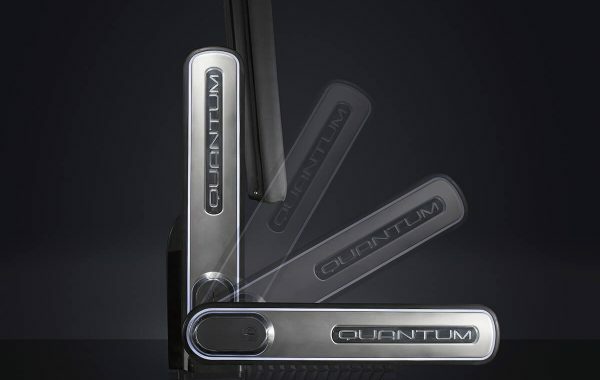 Once received by the OEM, individual packages within the QUANTUM box can be separated depending on the OEM’s assembly line needs. For example, the electrical wiring harnesses and interfaces will be in a single box, yet still packaged with the complete unit received by the OEM. We anticipate it will be possible to ship the components separately in case an OEM has multiple manufacturing sites. What are the interface options for the QUANTUM? 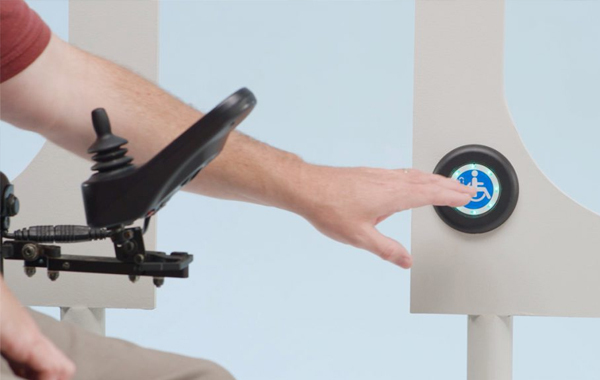 QUANTUM comes with a driver interface and a user interface that is installed against the wall or seat at the wheelchair passenger position. What is the expected Maintenance on the Quantum? Arm Grips: The arm grips feature a very durable over-molded rubber. 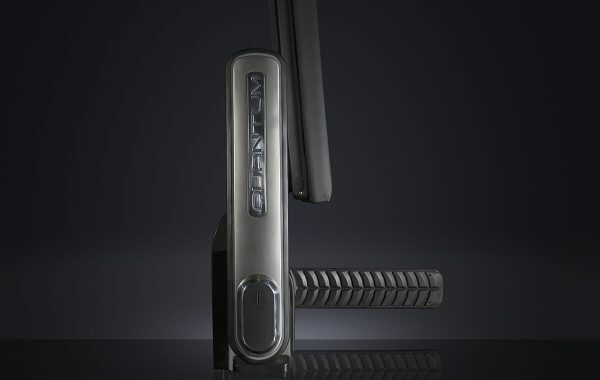 While we don’t anticipate normal wear and tear to cause any visible damage to the rubber, the design of the QUANTUM has anticipated field replacement of the grips and will be available if required. What additional testing has been performed? Salt Spray Testing, Drop Testing, EMC Testing for EU regulations, Destructive Testing, Vibration Testing, Movement Testing, Crash Test at 8G, Static Pull Testing on QUANTUM with backrest, Humidity Testing, Water Ingress Testing. 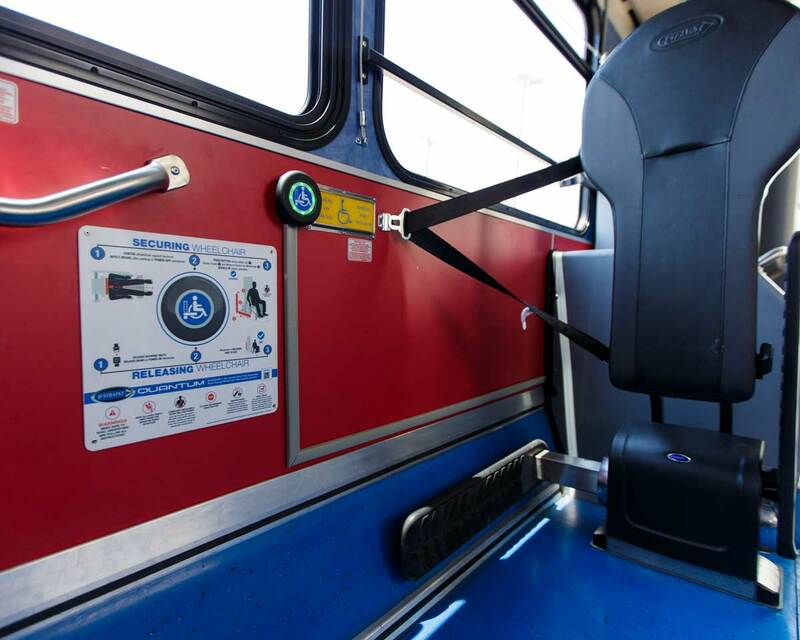 Can the Quantum backrest fabric be matched to the vehicle seating? 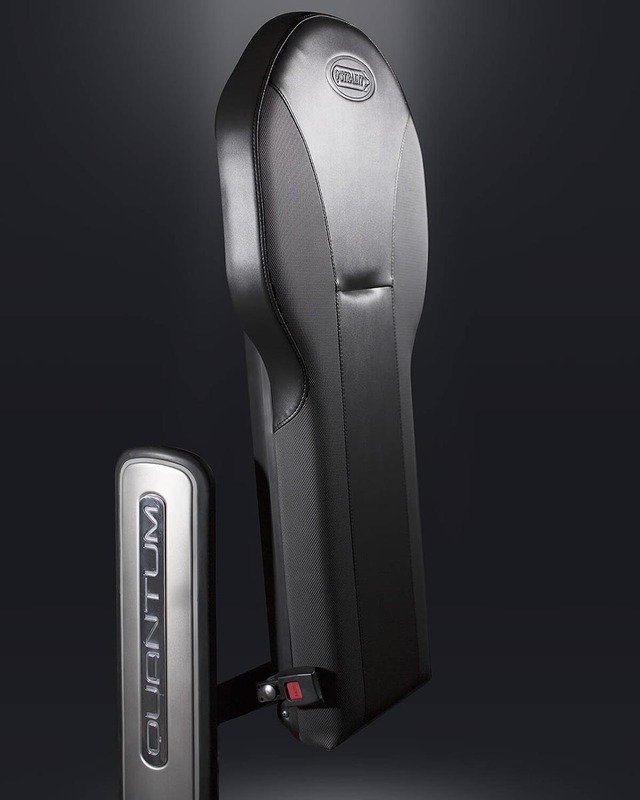 The QUANTUM backrest is available in black and dark grey durable vinyl and is designed to be neutral against different fabric and color schemes throughout vehicle fleets. Is a Quantum stanchion required? A stanchion is not required for the QUANTUM. 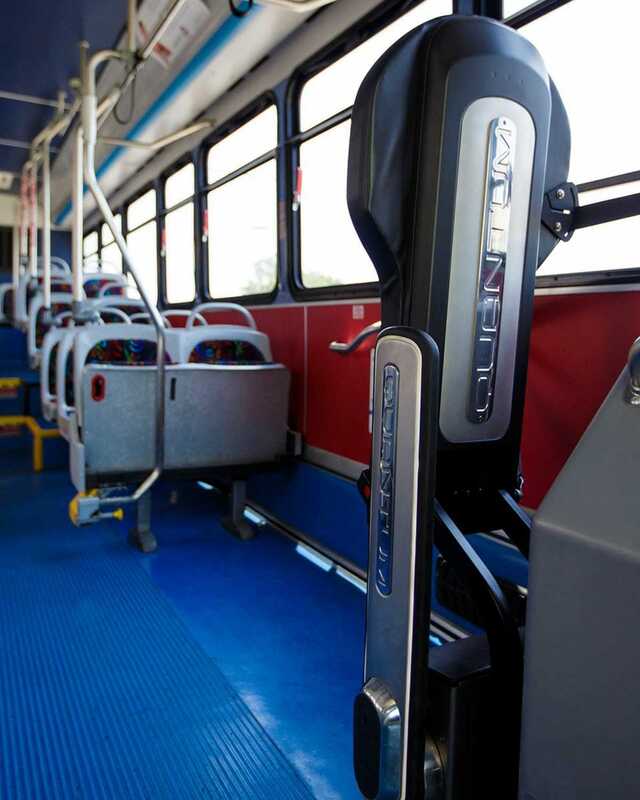 However, the QUANTUM features two mounting provisions to allow customers to attach stanchions if that is their preference. 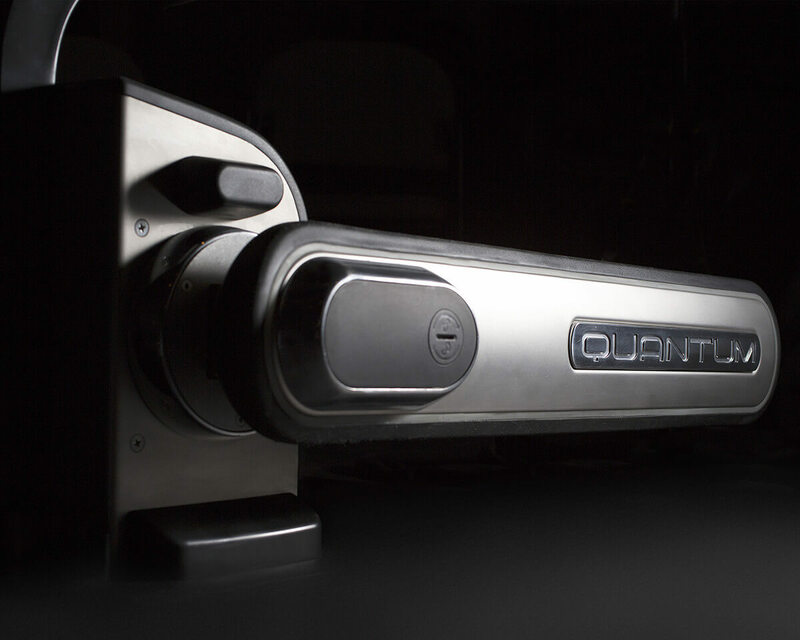 QUANTUM is a stand-alone system. Can the user interface be mounted on the wall flip-up seat? 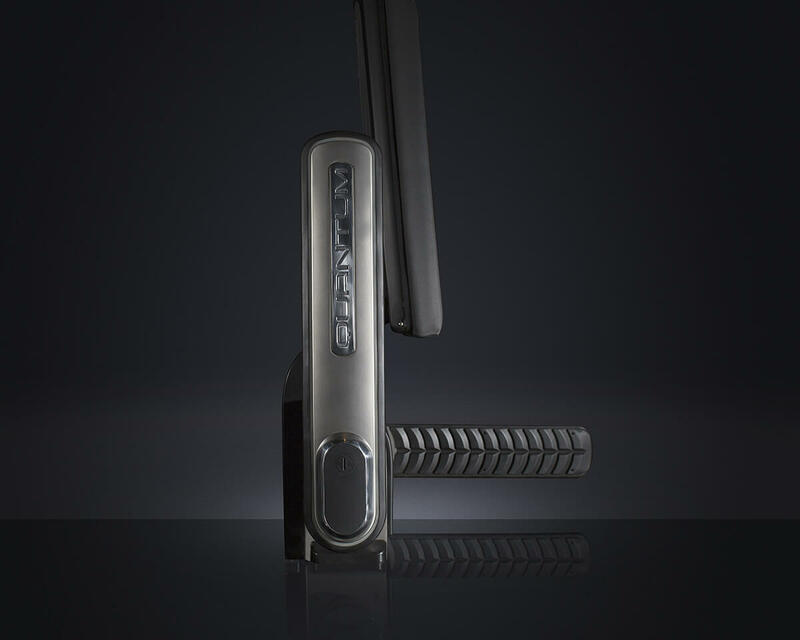 The user interface is mountable onto any flat surface, including the underside of theater-style flip up seating. 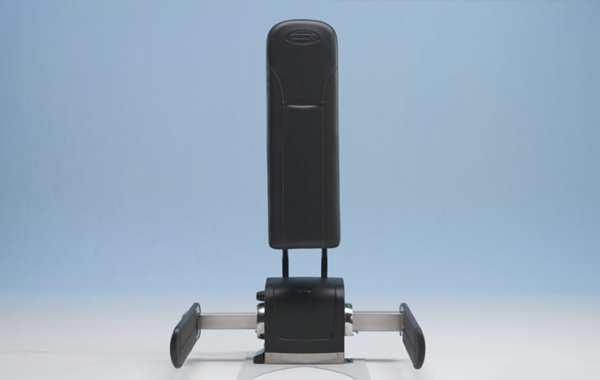 Theater-style flip up seats may also be purchased from seating manufacturers with the QUANTUM User Interface pre-installed.